← I laughed. I cried. I ate a lot of biscuits. While you’ve been spending time looking up your old boyfriends or girlfriends on the internet – wondering how they’ve aged or if they’ve ever managed to settle down – I’ve been looking up my grandmother’s old butcher, Michael Buckle. I wondered what happened to his little shop. Is it still at the corner, where Priest’s Lane meets Hutton Road? Are there still feathered pheasants hung by their leathery feet in the big glass windows? Are the wide baskets full of brown eggs really still sitting just to the right of the glass case? I’ll never forget his fat pork sausages, browned sticky and crisp alongside my grandmother’s cauliflower cheese. I hoped his business hadn’t been swallowed up by the local Waitrose or Tesco. 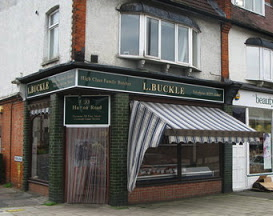 In as much time as it took to type “Michael Buckle butcher” into the search window though, suddenly, there was the photograph: L. Buckle, High Class Family Butcher in gold letters on the sign over the window, surrounded by glossy dark green tiles. I wonder if “L.” might be his son. In the photograph I can see the low display cases through the window, shaded by a striped green awning outside. I can see also, that the excellent candy store that was next door, the one with the small white chocolate mice, has gone, replaced by a beauty salon. If I look down the road the other way, (oh – the beauty of the panorama view in Google Maps!) I can even see my grandmother’s red brick semi-detached house with crisply painted white trim, looking very English, three houses in from the intersection, just down Priest’s Lane. Granny and I would walk over to the butcher after breakfast a couple of times a week, for a roast (roll the “r” lavishly please – my grandmother spoke English with a heavy Norwegian accent) or some bangers or maybe some mince. Michael was a big, moonfaced, funny man with curly brown hair in a bloody white cotton apron, standing behind the counter. Once he challenged me to find a white egg in his basket full of brown ones, promising I could throw it at him, if I ever did. I begged my grandmother to go to the shop daily until finally I found that one white egg, in the middle of the 1976 July heat wave. My grandmother, Michael and I went outside on the sidewalk. I threw that egg as hard as I could, and splat! I missed. Humiliating. The egg fried right on the sidewalk in a just a few minutes. It was that hot outside. I used to bemoan the lack of a Michael-Buckle-style butcher here on Capitol Hill. I used to drive all the way to A&J on Queen Anne. Used to. 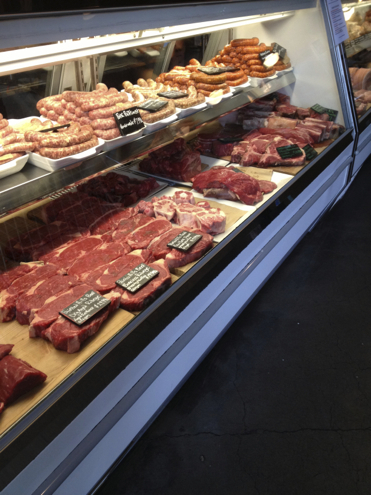 The local butcher, Rain Shadow Meats, is a short drive from my house on a cold day or a long walk on a warm one and I head over there a couple of times a week. I’m glad to have a local place to buy meat, believe me, but there is no way anyone would be encouraged to throw an egg at one of the butchers at Rain Shadow. These guys are very serious. So serious, they even seem to lack the ironic poses adopted by so many people working in the Pike-Pine neighborhood. There’s the guy with the knit cap, he’s actually pretty friendly if a little reserved. Then there’s the tall one, he’s super-serious and intense. The answers to my questions seem to be painfully obvious to him. Then there’s the girl. I might have stressed her out one day by asking too many questions about how to make sausage rolls. Sorry! (“But I’m just an apprentice butcher! she said nervously, when I encouraged her to give me her best guess on cooking time.) It wasn’t really a fair question anyway. Sausage rolls are a British thing. I just miss good old Michael Buckle, or the idea of him anyway. As an old fashioned English butcher, he totally would have known about sausage rolls. 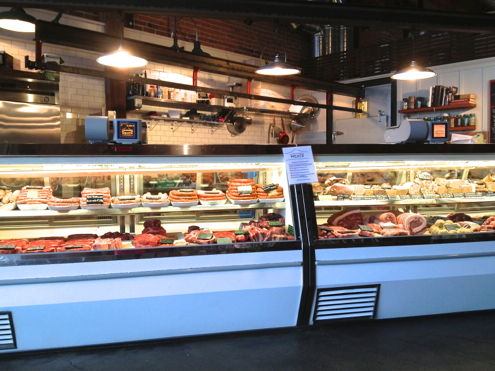 Our mission is to bring back the local neighborhood butcher with an emphasis on whole animal butchery, education, and the creation of community. We work with local farms to provide farmers with a means to reach the public through our customers and to guarantee the highest quality products…. Very admirable. And it is quite perfect. I’ve tried everything from whole pieces of meat to their charcuterie including beef tenderloin, pork roasts, ham (tremendous! ), whole chickens and expertly broken down chickens, various fresh sausages, guanciale, pancetta and bacon. I saw a rabbit in the case the other day and I can’t wait to get one of my own and turn it into papardelle alla lepre. The only odd thing I’ve noticed is that they didn’t tie my beef tenderloin roast at Christmas. It didn’t turn out to be a problem as I can tie one easily, but lots of people can’t. And I guess they thought I wouldn’t want the chicken’s back when they broke down my chicken for me yesterday. If I didn’t want to deal with the back, I could’ve gone to a grocery store. It was destined for the stock pot. When I called to find out what happened though, they were very apologetic and promised to save it for me, although I can’t see running back over there for a back. Oh well. These are minor irritations. I may never darken the door of Whole Foods again, at least not the meat department. One thing to note, you will pay more to eat meat that has been this carefully and responsibly raised. Eat less meat of better quality and more greens, that’s my resolution. All I need now is a proper green grocer. And while I’m wishing, how about a baker too? Preferably within walking distance. For those of you who are curious, here is the method for making sausage rolls. In England, we had them for Christmas although I bet they would be a hit while watching the Super Bowl. Roll out all the puff pastry into one long rectangle about 1/8 inch thick. 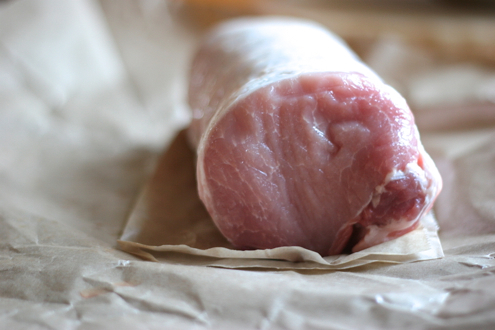 Form the sausage meat into a log about 1 inch thick and long enough to fit the length of the pastry. Lay this log along the long edge. Carefully roll the pastry around the sausage, brush with beaten eggs where it joins, then cut so that the pastry has just enough room to slightly overlap. Repeat the process with the remaining sausage meat and pastry. Making sure the seam on each is at the bottom and not showing, brush the tops with the eggs and cut the sausage rolls with a very sharp knife in 1 1/2″ pieces. Arrange about one inch apart on a baking sheet, and bake until golden brown and the meat is cooked, about 15 to 20 minutes. Serve warm or cold. This entry was posted in easy, Fast, Uncategorized. Bookmark the permalink. Me too! I go to Uwajimaya (an amazing huge Japanese grocery and purveyor of all kinds of cool stuff) sometimes. They have an excellent fish department. As soon as the street car is complete – it will be so much easier to get down there! I know what you mean about the hipster butchers though…I wish there was an emoticon for an “eye roll”!